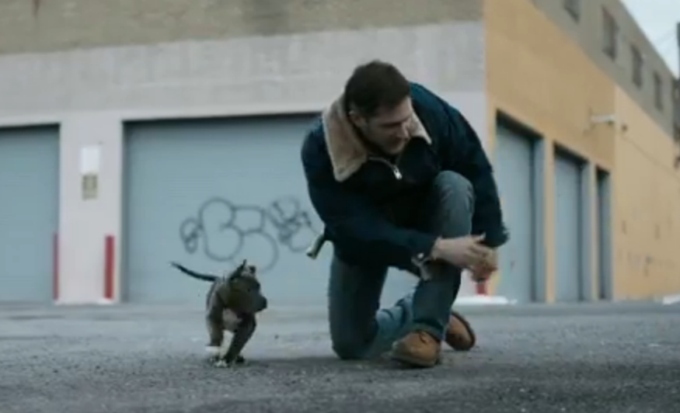 “The Drop” is a story about a man and his dog.. okay..and his cousin/boss who used to think of himself as a ‘big man’..and a girl whom he likes who randomly helps him take care of the dog..but might be linked to more…and an arm with a watch..oh and throw in a bit of Chechen syndicate who ‘the drops’ are for…and lastly..you find out the man with the dog has much more to him than meets the eye and is much darker than you thought. 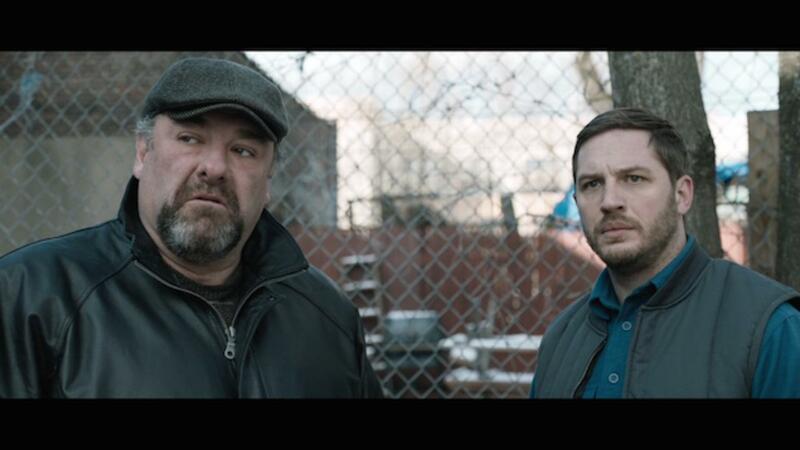 Tom Hardy is a man of many accents..this we have learned and Hollywood’s most recent ‘it/go to’ guy does not disappoint with his interpretation of this Brooklyn/Crooklyn accent either. As the screen rolls up you hear a voice that sorta sounds like Christopher Walken just rolled in after gargling with a shot of whiskey..and lo and behold, It’s a very believable Tom Hardy as “Bob Saginowski” in this quite mesmerizing performance as a somewhat shy, but yet charming bartender at what used to be his Cousin Marv’s (James Gandolfini) local neighborhood dive bar aptly named ‘Cousin Marvs’ which is now owned by the Chechen syndicate lead by “Chovka” (Michael Aronov) and used, when designated to do so, as the ‘drop’ bar, a place where all the nights drop payments to this syndicate are made and then picked up. Basically when it’s your night, envelopes stuffed with cash get dropped off into a time-released safe which is then picked up at the specified hour by a designated main guy. Simple enough riiiiggghhtt.except Marv, in Gandolfini’s last spin in a role that was clearly made for him, has decided he wants to go back to his glory days of being respected and plans to heist his own ‘drop’ day, tries to pull off a practice heist with 2 local guys, “Fitz” (James Frecheville) & “Rardy” (Michael Esper) which doesn’t go over well with all involved. Now you must be wondering where the dog fits in..well oddly enough, this movie is actually based on the short story “Animal Rescue” by Dennis Lehane in which a tough, but sweetheart of a guy, with a rather dark past, finds a badly beaten pit bull puppy in a trash can and it gets him into some big trouble.. As with that story, in this one Bob finds said dog in “Nadia” (Noomi Rapace) garbage can & she randomly offers to help him take care of it. I won’t lie..there are some wonderfully cute scenes with Hardy & the little doggie Rocco..he’s a little scene stealer that Rocco!!! 😀 But turns out Nadia also has a bit of a history..with “Eric Deeds” (Matthias Schoenaerts) who is not only a complete psycho-path, but also the a-hole who beat little Rocco and left him for dead, yet stalks Bob with much malice to try to get the dog back insofar as even threatening Nadia’s life. Eric has a reputation behind him, and now Marv is going to use him for the big cache heist day. The whole time everything is going on, we see Bob attending 8am mass everyday at the local Catholic church, which we figure out later just why, but where he has the attention of the very police detective investigating not only a past neighborhood murder from years earlier, but the recent robbery at the bar. “Detective Torres” (John Ortiz) just knows somethings fishy with the whole scene there at the bar, most especially focusing on Bob whose unassuming ways almost had me thinking at one point he might be a bit daft as in not-so-bright, but that’s really just all part of the charm of Hardy in this role..because even though you might think it for a moment or two, it’s because he wants you to. This gutsy, gritty & sometimes funny film ends with a plot twist that I don’t think most will see. but it definitely answers all your questions. I mean I had an idea of what it was, but it was so well thought out and done that I was really never sure which way it was going to go until it actually happened. 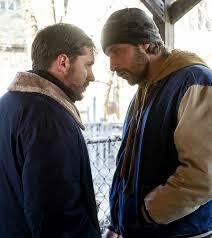 Again, Hardy is just simply wonderful in this role along with Gandolfini, they make a great dark comedy team which sadly we will never have the chance be able to see again. (Peace be with you James Gandolfini, you will always be remembered with your great body of work) Noomi Rapace is good, and I enjoy her a lot in most films she’s done, but honestly she is out-played here by pretty much everyone and the character is a one that the if it was left out of the film entirely, you wouldn’t have even missed it. A big huge kudos from me also goes to Matthias Schoenaerts. This Belgium actor deserves a big nod for playing his role so well and holding his own in such good company, hope to see much more of him in upcoming films. My vote is that you see this movie even if it’s not your cup of tea, for the performances alone. I need to see this! 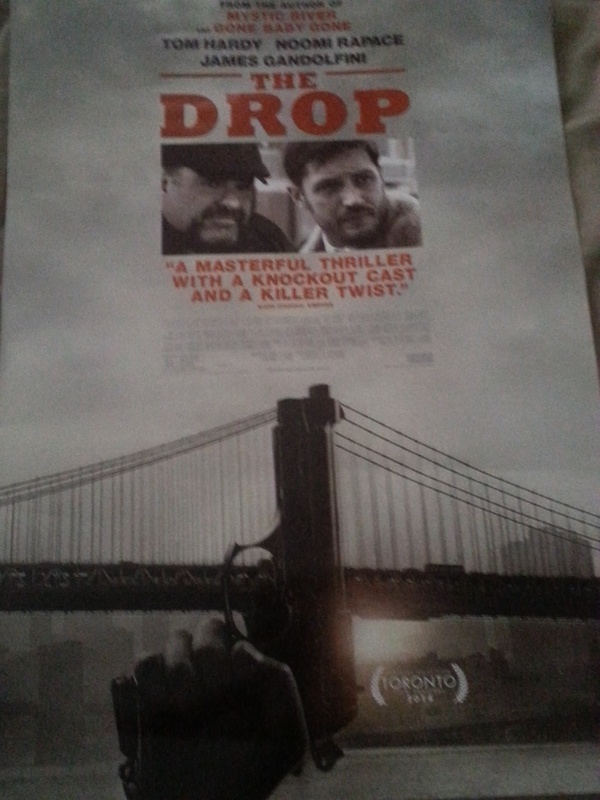 Not expecting greatness but I usually enjoy these crime movies, and having Gandolfini & Hardy can only be a plus. Solid review. Thanks Taj!! and yo..I gave it an above average..but yeah..barely..it was cuz of the reeeeallly good performances.. Besides my absolute love for Tommy Hardy…I thought Matthias Schoenaerts was just so good! and of course Gandolfini.. miss him.